One day, a polar bear knocks on Sophia’s door. He’s desperate; his Arctic home has melted away and he has nowhere to go. It turns out that the polar bear isn’t the only one with a problem. More and more animals and people arrive at Sophia’s door: farmers whose land has flooded, fishermen without anything to fish, a swarm of bees confused by the climate, a sea turtle and many more who had to flee their threatened habitats. Being overwhelmed initially, Sophia soon feels compelled to help. But she only meets with resistance and dismissals by her local government officials. Utterly frustrated and realizing that she’s not getting the necessary attention, Sophia throws a ‘tantrum’, so that her message is finally heard and ends up traveling around the world. The book consists of two parts. The first part is the story about Sophia who inherits a huge problem she didn’t ask for, feels all kinds of frustration as she tries to solve it, and then channels those strong emotions into positive action, inspiring all those around her to do the same. 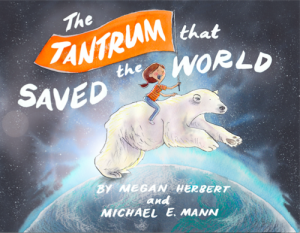 The second part explains the science of climate change to children in language they can understand, telling the stories of the climate refugees that appear in the story, and how all their lives are interconnected. An action plan then outlines simple and positive actions every person can take to make a real difference and to become the heroes of their own stories.